This year, top athletes from Europe, Asia, North and South America will battle for a coveted spot at next summer's Olympic Games in the UK. The $150 thousand dollar prize should be an added incentive to help motivate those athletes to realize their Olympic dreams. “There are only four tournaments of this kind in the world – in France, Brazil, Japan and in Russia. Each year, there are more countries and athletes participating. This time, as many as 64 nations have already signed up for the Grand Slam, so it is a record by itself,” Anatoly Laryukov, Sports Director for the Russian Judo Federation, said. It's no secret that Russia's Prime Minister Vladimir Putin carries the Judo's torch for his fellow countrymen. Putin competed back in the 70s in the Soviet Union and now he's considered an embodiment of everything the sport represents at home. 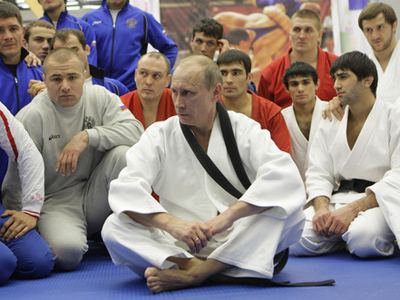 Despite a busy Prime Ministerial schedule, Putin still finds time to train and preside over a judo club called Yawara-Neva in St. Petersburg. And, of course, he is expected to appear at the Moscow Grand Slam. “You can see Putin's technique right away – any professional would know instantly that he's done some serious training – it's in his posture, arm movement and destabilization techniques. It does help us that he's the Prime Minister, and we sometimes even brag about it. But it was his personal request to ensure that our athletes win Olympic gold, and that we provide all the conditions to achieve that,” Laryukov explained. Moscow's Grand Slam will be the first step for many competitors on the way to reaching the Olympic summit in London.